Oki’s Movie is a curiosity: A series of short films within a film which purport to be based on the autobiographical musings of its fictional titular character, starring actors chosen for their resemblance to that character’s “real life” partners, as well as herself. It’s a potentially confusing premise that somehow comes together beautifully to create a picture that’s both captivating and emotional. Meant as a purging of Oki’s emotions, she’s made four short films; each featuring a character patterned after herself, a young man and an older man. In the first short, Oki is only a fleeting presence in the life of aspiring director and film school teacher, Jingu. Being a young fellow surrounded by emotionally charged female pupils who specialise in drama, Jingu’s marriage to his cranky wife doesn’t stop him from initiating doomed affairs with the student body. He’s also trying to navigate his way through the faculty, which is rife with favouritism and in-fighting. The ham-fisted clumsiness that pervades Jingu’s life isn’t helped by his low tolerance for alcohol, which imperils his tenure when his supervisors don’t appreciate his intoxicated blabbing about sensitive subjects at a teachers’ night out. His careless affections are equally explosive as the consequences for his affairs turn up at inconvenient and embarrassing moments. In the second segment, a different, younger Jingu is now a film student whose only intoxication is the sweet Oki, who allows the whirlwind of Jingu’s affections to carry her away, but only so far. Jingu practically becomes a stalker in his attempts to convince Oki of his real love for her. In segment three, a snowstorm finds Oki and Jingu -- neither drunk nor dating -- as the only students who make it to their professor’s film class, and the informal gathering becomes more about a sad, older man’s jaded views on life and love, which he departs to his pupils. The final segment is the closest to Oki’s heart and the climax of the cinematic experiment; where Oki describes two different New Year’s hikes up a mountain with two different men. Relating the scenarios in play-by-play style, she compares both lovers; the first, an older, married man, and the second, a fellow closer to her age. She makes notes of what each one did at specific points during the walk and how their actions made her feel. Her notion is that if she can reenact these moments with actors who look closely like the actual men she loved, and an actress to proxy for herself, she can see it all recorded on film and thus detach herself enough to sort out her feelings about those two relationships. The premise is original and clever and the execution charming and well-acted. As Oki, Jung Yu-mi is a radiant cypher in her own life stories; simultaneously buffeted by the actions of the men in her life, as well as the center of each man’s world. As the older gentleman and the professor, Moon Sung-geun is dashing enough to make the audience understand Oki’s fascination. It is, however, Lee Sun-kyun’s ego-less performance as Jingu, the character who ranges from callow and thick-headed, to achingly lovestruck, to hilariously goofy throughout the different segments. He grabs you right off the bat with the first short; the most comedic chapter of the four, by playing a henpecked, philandering husband who blows any chance of advancement in his teaching career by bedding his students and embarrassing himself with drink at faculty functions. That hapless character is so memorable that it’s a jolt to realise we’ve gone into another short and he’s not actually who he played in the last piece; but this time as a young man in love with a cautious girl, no less winning. I’ve never seen a film as ingeniously structured as Oki’s Movie that didn’t somehow feel like a gimmick. 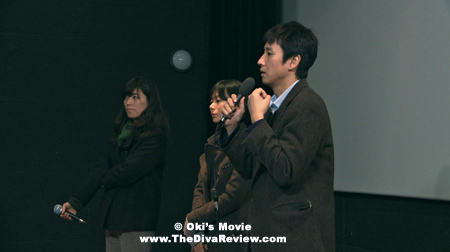 Despite it’s meta-biopic premise, the film carries authentic emotion: Whether it’s the comedy of its opening short, or the melancholy of both the older teacher who’s decided to call it a day and the young woman of the final scene who can’t understand how she can love two different men so entirely, Oki’s Movie resonates and lingers in the mind long after the four stories are told.